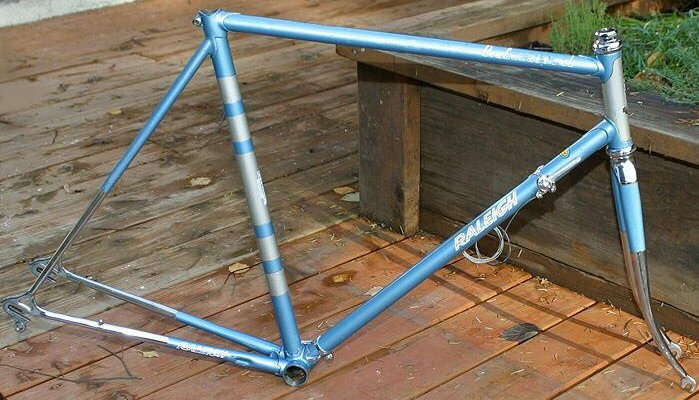 The backstory: Half-rough Raleigh Pro Mk.IV frameset at LBS. Price out of line? 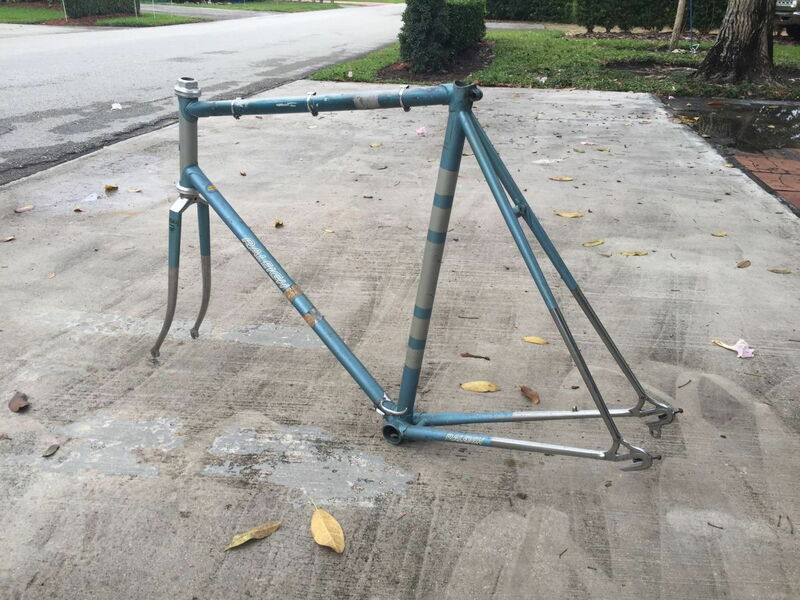 To make a long story short: The LBS had a Raleigh Professional Mk.IV frame that they offered me for $275. Top tube is a chipped and spraybombed mess, ruining what is otherwise a nice frame, but I'm an adventurous idiot who prefers what's in front of him rather than the nicer stuff on eBay. After some separation anxiety, I so I posted it up on the Valuations forum (since I've been out of the hobby for a while) and finally decided to go back and see if they'd come down on the price. Turns out I had misunderstood them all along - $275 was for this and the '78 Super Grand Prix in the corner, Suntour barcons and all. 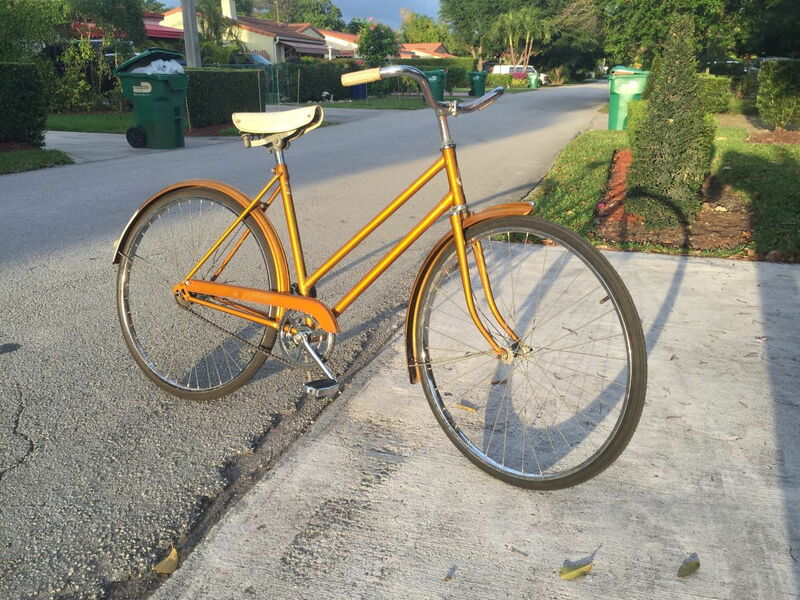 It's complete, original, has a bit of top tube rust, and it is 100% meh. Thing is, many folks like the Grand Prix. I couldn't be less enthused about them. I don't like the lugs, the straight-wall 27" rims, the Suntour RD, or the Raleigh-rebadged SR cranks (that always bend at the pedal eye). 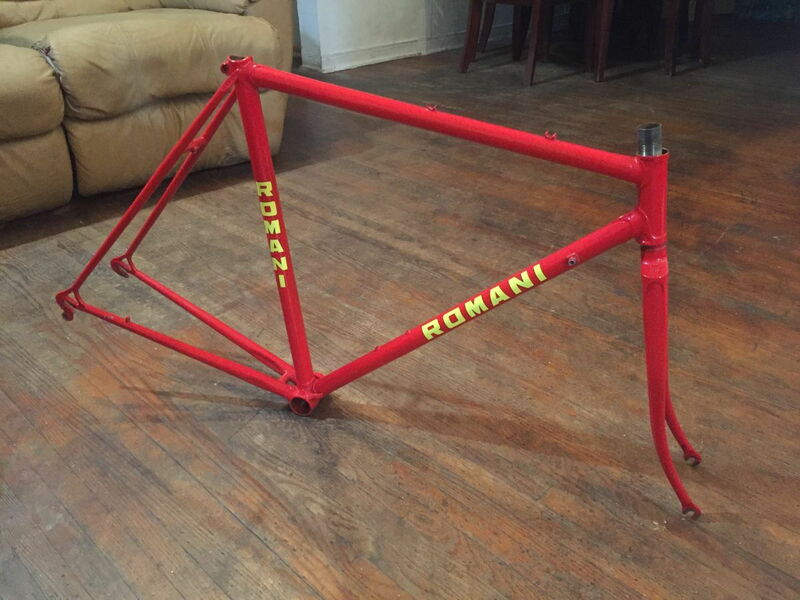 So I point out that I'd really prefer the repainted Romani frameset with the possibly stuck seatpost that's languishing in the corner - which I knew they wanted to get rid of. 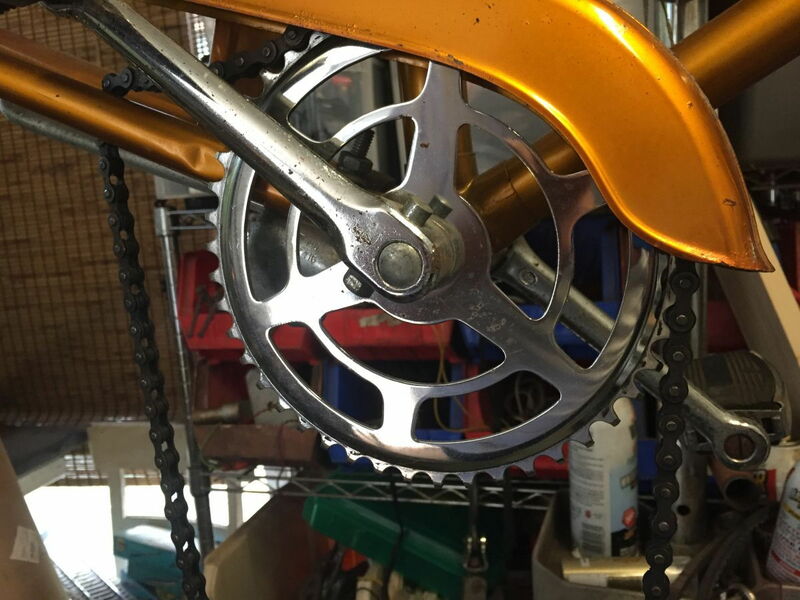 They do, however, want to keep the Nuovo Record and Shimano Dura-Ace/600 bits off of it. Price stays the same, but the shop throws the Romani into the deal. I'm still protesting the Super Grand Prix and also counter that I have to strip the Romani for them too. 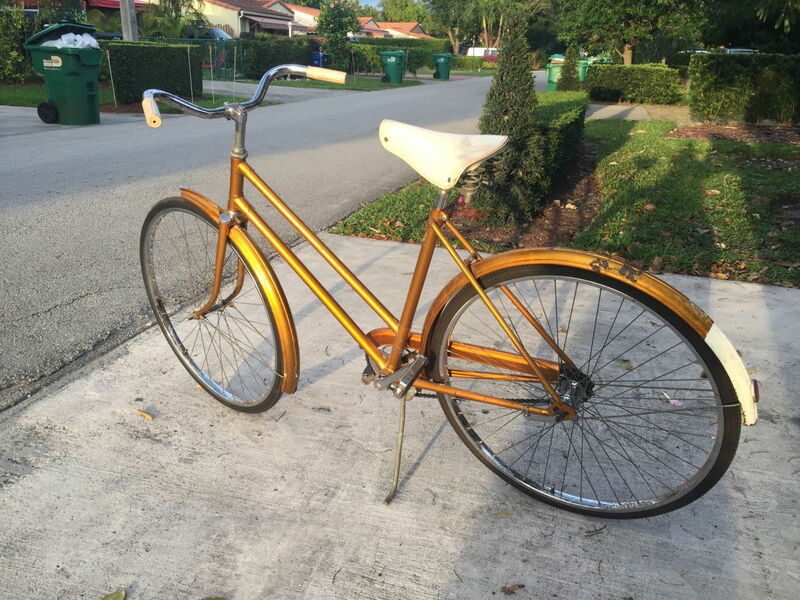 That's when they shut me up by throwing the gold ladies' Robin Hood (same as a '70-72 Raleigh Sports S22L) into the deal. N + 1 = N just became N + 4 = N.
I didn't have room to haul everything, so I took the Romani and the Professional framesets and agreed to pick up the rest over the weekend. In the meantime, the part everyone's been waiting for - the pictures. 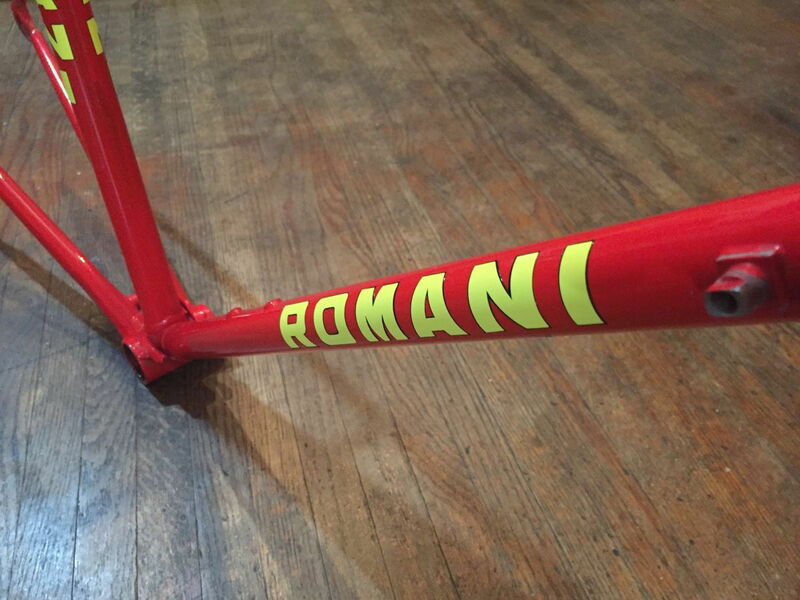 Here's the Romani, fresh from the shop with the nice bits on it. Sadly, not my bits. 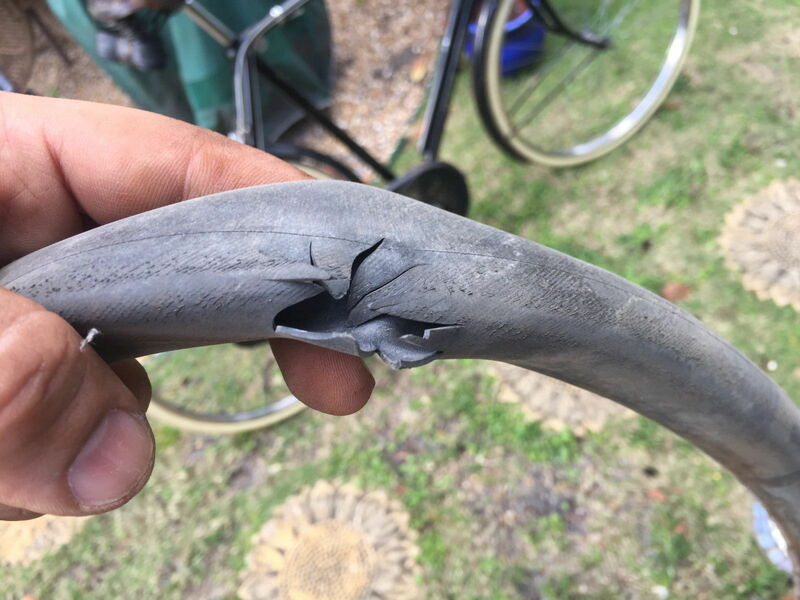 And in about 30 minutes, it looked like this - and the seatpost was finally moving. Not up and down, but it does rotate. I wish I had an inverted vise. 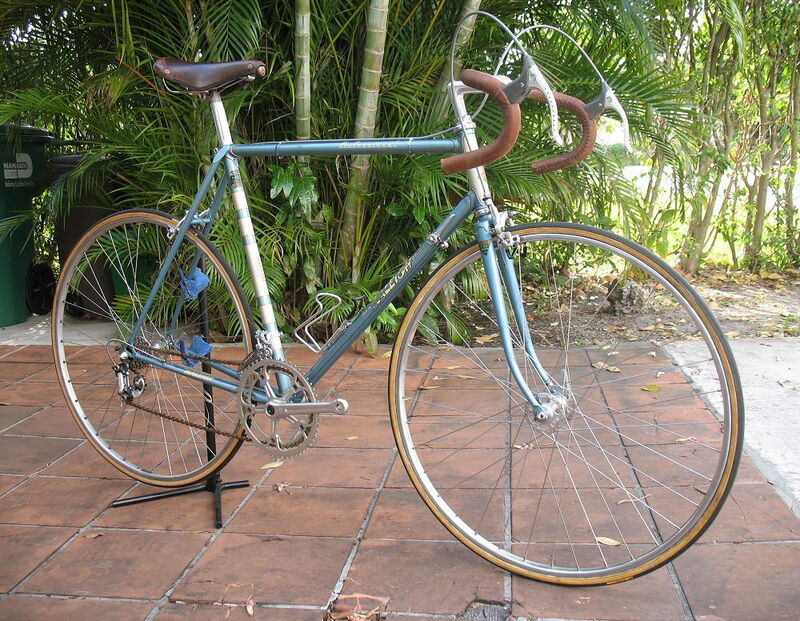 And the best for last...if you can call that top tube "best" of anything other than "craigslist." and it's your size, if I remember correctly. Nice little bit of trading there. That overspray will just wipe right off, you dog!, great bargaining! waiting for the other bike pics too. It's a 23.5" - pretty much spot on. My Mk.V is a 22.5" and fits well as-is, but I can fit either quite well. I'm looking forward to getting them together for a side-by-side shot. Not convinced it'll come off and everything will be rosy. There's some nice chips under the primer, and someone has sprayed an alternate match to the mink blue up there before. 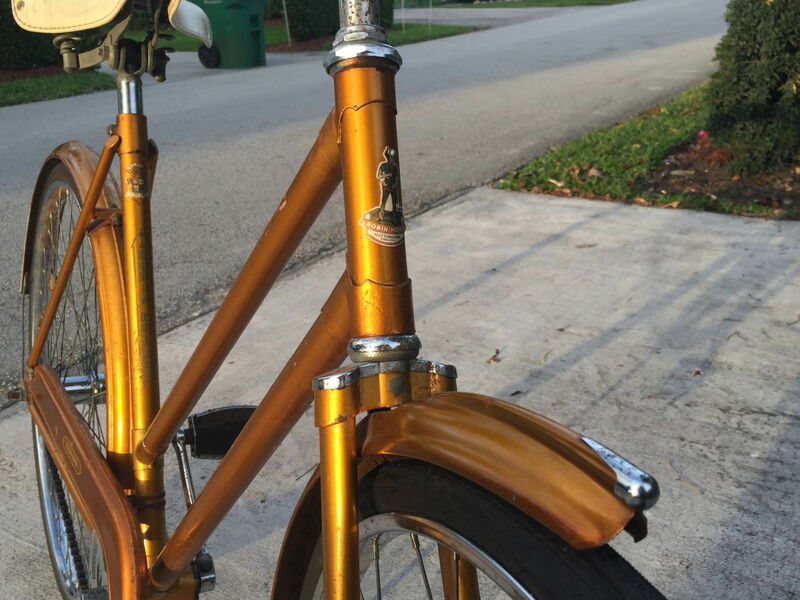 There's a painter in the neighborhood who may be able to help, but I don't think he's ever done a thin bike paint job before - not sure if he has the skill to pull it off. We'll see. Last edited by cudak888; 04-04-19 at 06:25 PM. 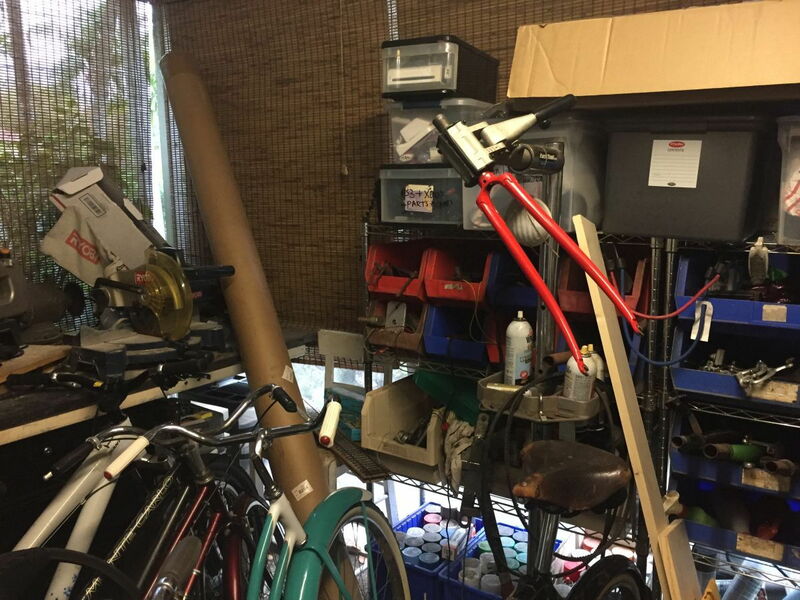 the framebuilder near here that used to remove stuck seatposts used to hang the frame from the ceiling and pull on the seatpost with the knee of his milling machine. Not sure how he decided on that technique vs. milling them out on his lathe, which was his most common technique. 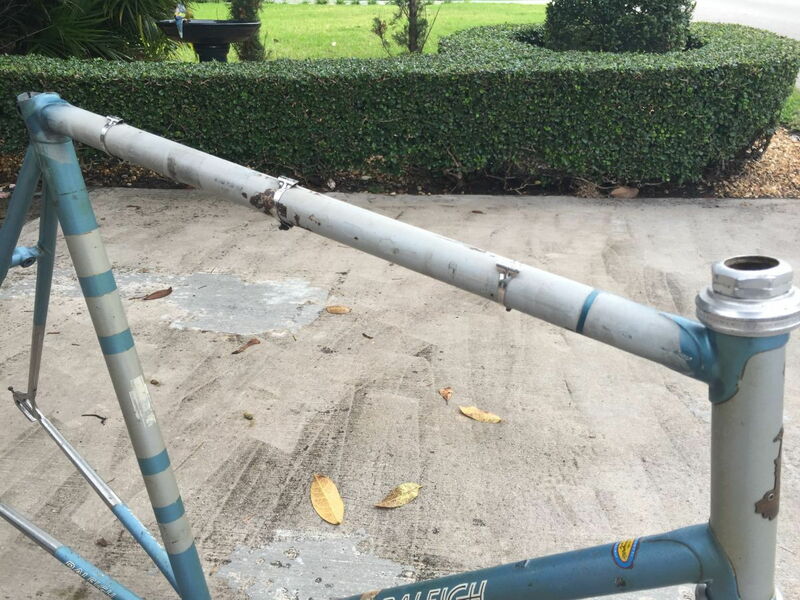 But it sounds like the seatpost that rotates would best be removed by brute force, and it might not take that much. I'm trying to envision this. How did he hang them so they didn't flex, rotate, or get damaged at the mounting points? 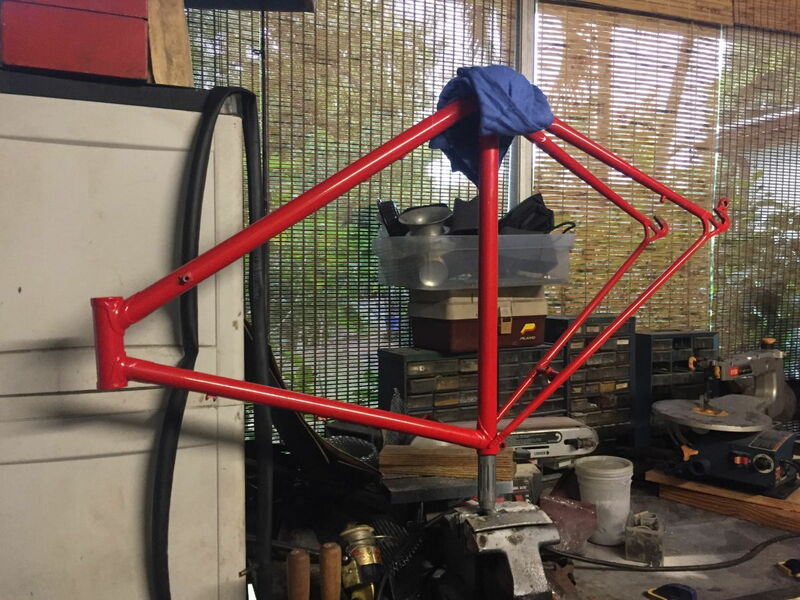 Part of the reason I think an inverted bench vise would work is because the pressure would be entirely a human hand on the top tube - unless someone were to get over cocky and stand in the triangles while another rotates the frame. But hanging it and using a milling machine to pull? Sounds like a recipe for a flattened tube unless multiple structural points of the frame were clamped at their faces. Last edited by cudak888; 04-04-19 at 08:27 PM. A very nice Professional and a very good bit of wheeling and dealing, congratulations. 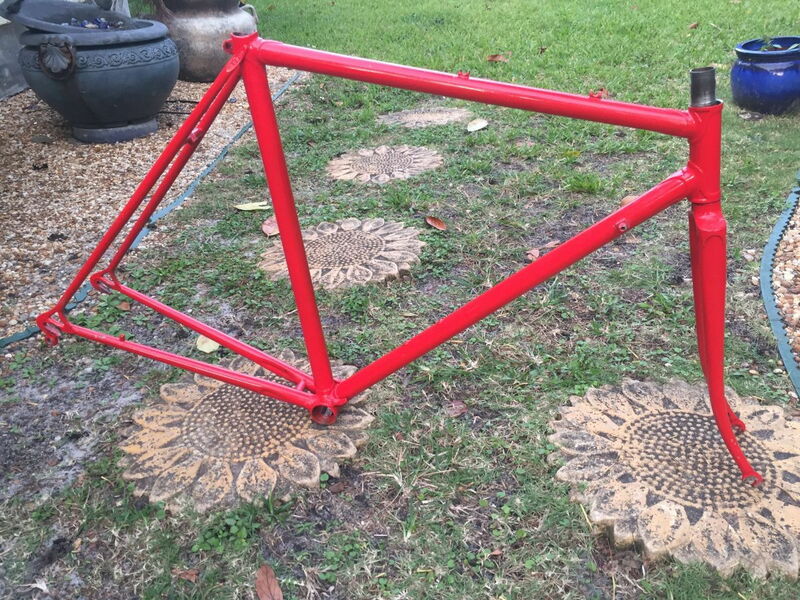 I bought my 1975 Raleigh Pro frame on eBay in 2006. 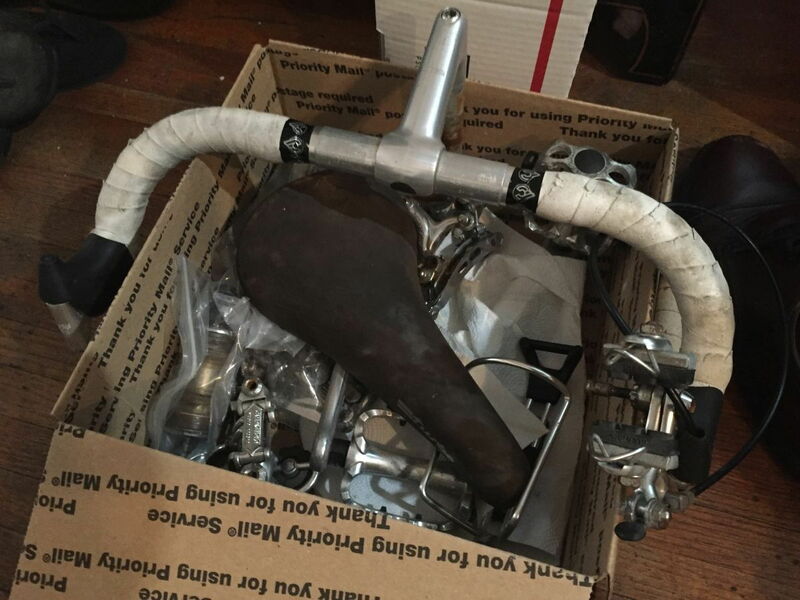 Paid WAY TOO MUCH but she came with an nice Campy headset, shift levers and cable guide. I got the FD and RD from the seller for a good price. Best thing, shipping was only $20! 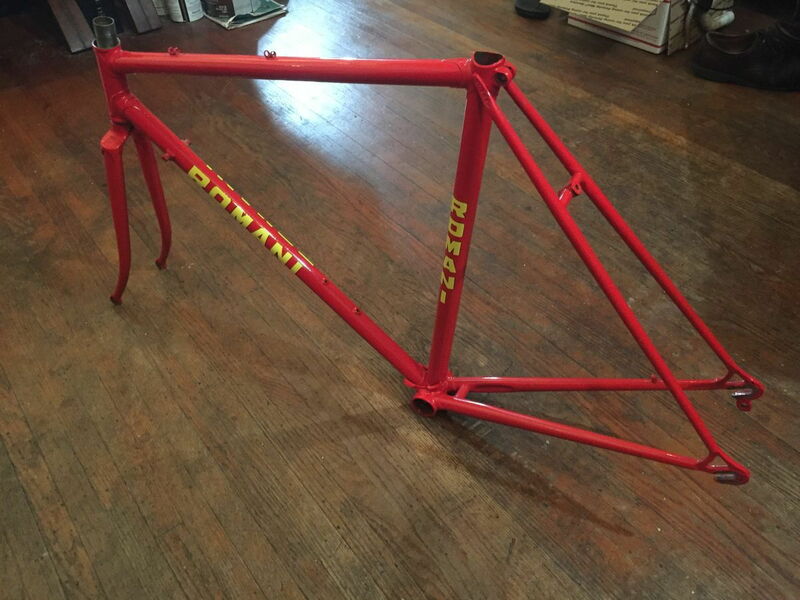 Frame arrived on a Saturday. Couldn't wait to take it out spin, so thew it together Sunday morning. I had all the Campy parts except for British BB cups so I put in a Stronglight 93 crank. Never got around to changing it. I should change out the cranks and start riding it again. Among the riskier moves I have done to remove a stuck post is to drive it IN first using a big mallet. 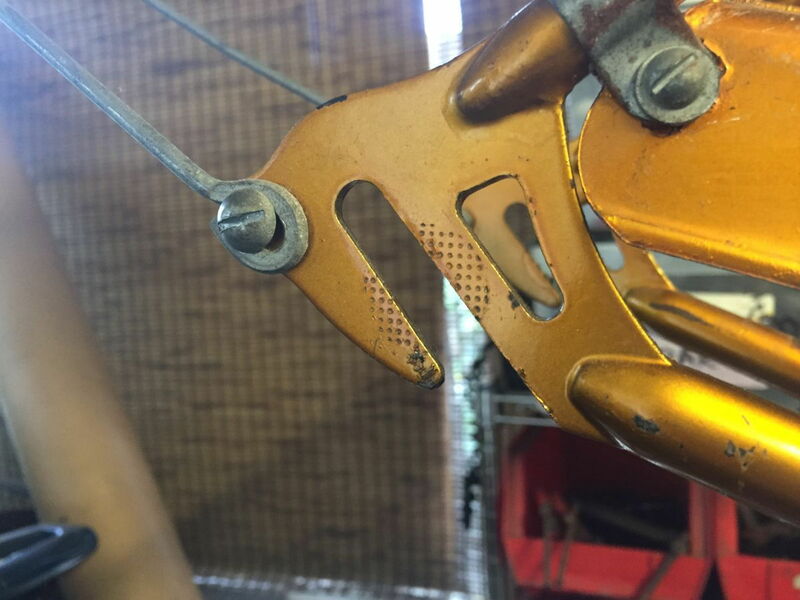 Mounted in a vise and twisting you need to be careful or you can bend the frame. I've done it. In the end, carefully cutting it out is the best option if if it badly stuck. But first, I will soak it with Kroil for several days and then put it in the vise. Never grab the stays to twist! Thank you! But it was almost entirely the shop's doing to wheel and deal the rest into the lot. Kurt, you have really jumped hard back into the C&V game! You may have some luck removing the spray paint and primer with lacquer thinner. Used sparingly it shouldn't hurt the original paint. More like hard into flipping for one darn frame. I plan to keep nothing but the Pro. 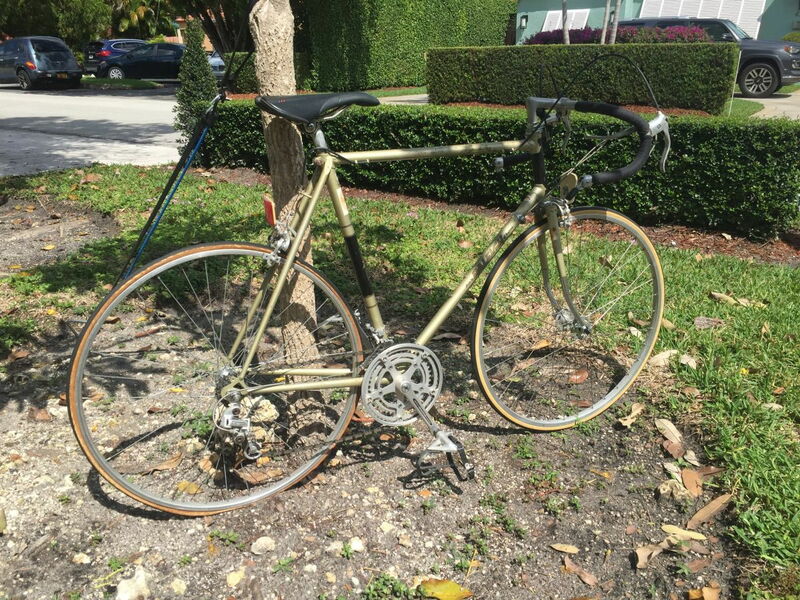 That doesn’t include the two modern Giant Brass 1’s, ‘84 Free Spirit Birittany, Ammaco city bike, and Schwinn City 2 that I have to finish. 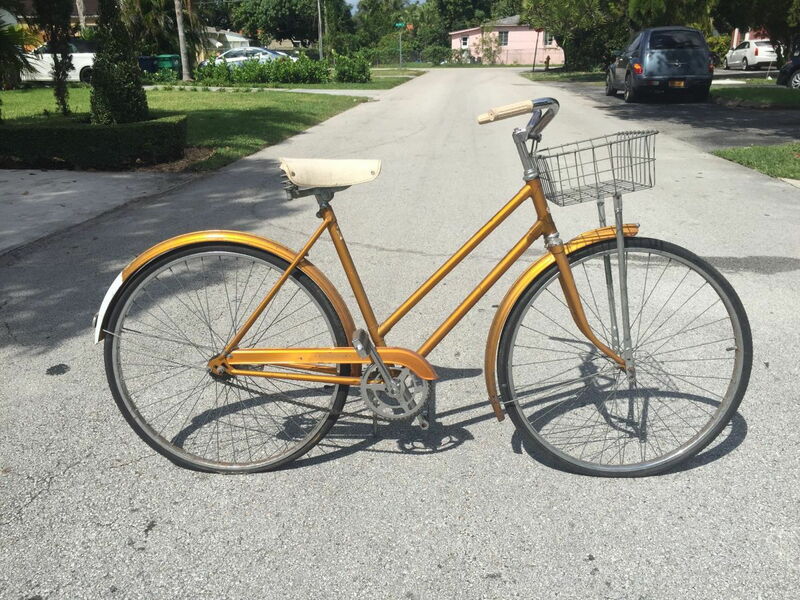 Oh, and the ‘49 Schwinn is back, also a flip (I can’t tell you how much I hate that thing). I can see that working like a reverse slide hammer. Not sure I want to risk it here, because - believe it or not - the SR post isn’t dead yet. If I could just apply downwards (or in the case of where it is now, upwards) force when twisting, it’d squeak its way out. ill only twist the frame from the head tube and seat tube. Stays are off limits. 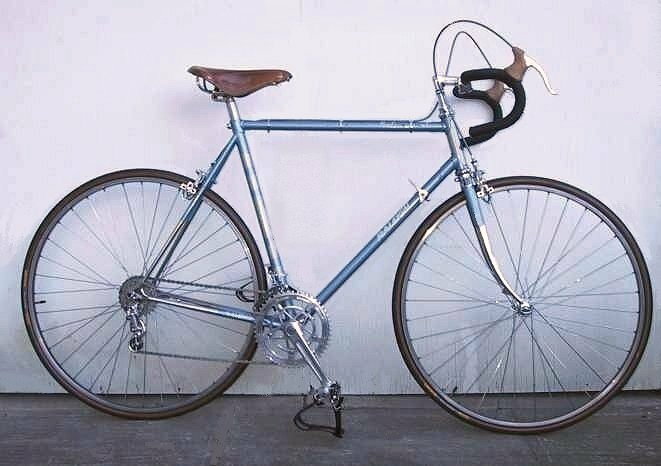 The Mk V frames from 22 1/2" up had more of an Italian bike ride and handling which was the trend at the time: steeper angles, shorter fork rake and wheel base. 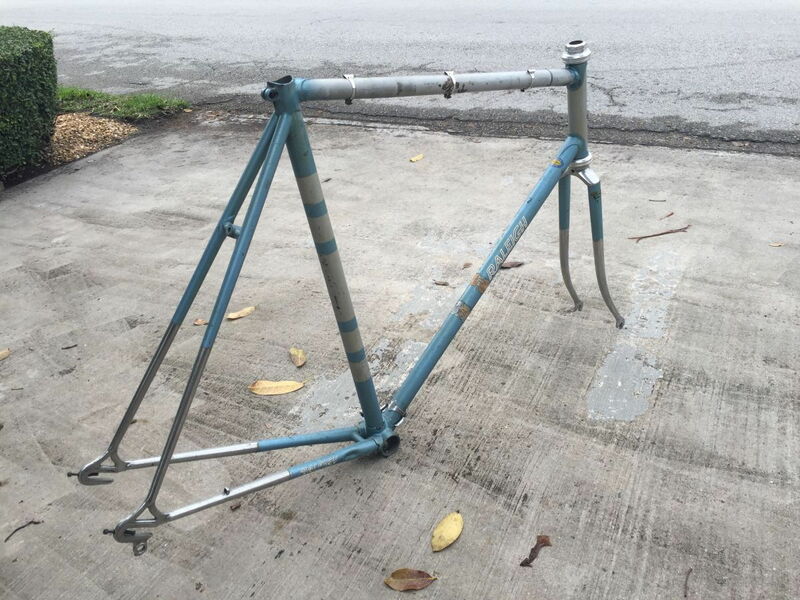 Something else to note, there were no real frame geometry standards at the Carlton works during the bike boom. The YOBs seemed to crank out whatever they hand on hand so you'll find variances in the Pros and Internationals. Can't speak for the Competitions but maybe the same. 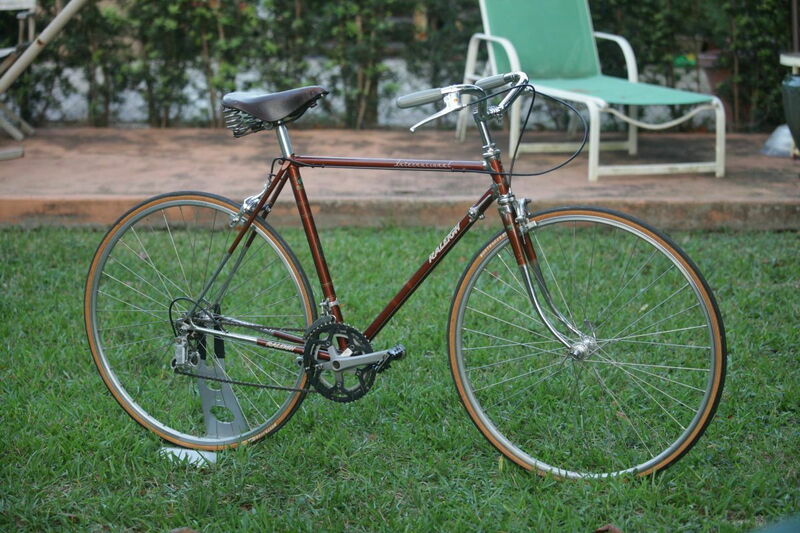 I have a 22 1/2" 1979 "Record" which was a Continental version of the Competition GS in team kit with a mishmash of mostly Japanese components. Rides like a tank compared to my Mk IV. I went looking for a pic and didn't find it. IIRC, he would hang the frame on a stick through the bb shell. You can bend a bb shell, but if the stick is about the same size as the shell then it will not bend enough to notice. 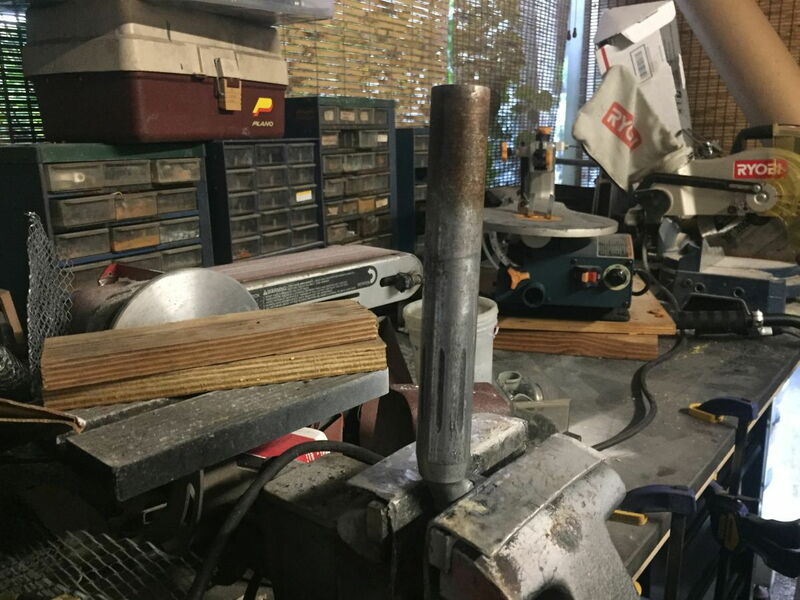 Someone said one of the pneumatic chisel/hammers would work. I bought one from Harbor Freight, and it did nothing. I feel like you could set up a slide hammer to pull. A stick through the bb would be a good idea. At this point I think you need impact or brute force. But it might not be a lot of force. 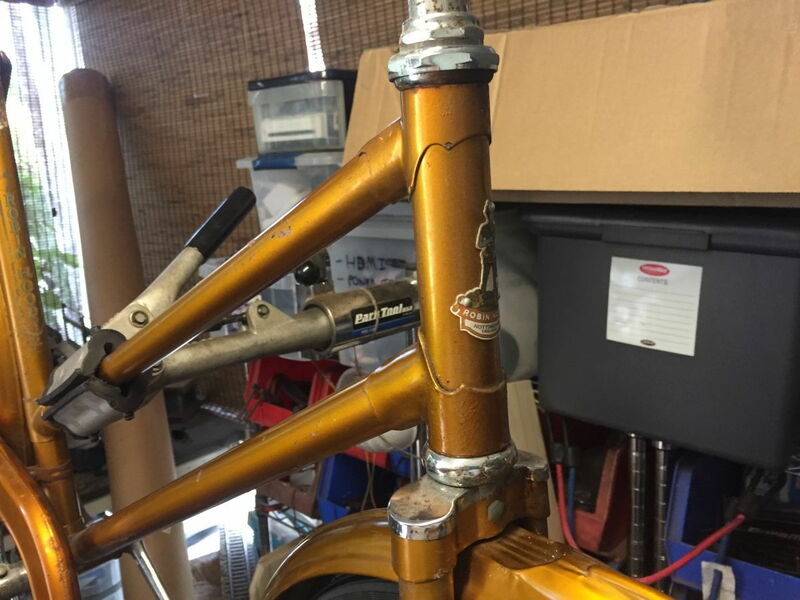 Just eyeballing the IV vs. the V is very telling - and, indeed, the V rides like some Italian whiz-bangery from the mid-'70s more than the slack "almost-a-Raleigh-Sports" geometry you'd expect of most English racing frames. The V is one of the zippiest bikes I've ever ridden, but I think that's on account of its tubulars more than anything else. It's like Raleigh woke up one morning and finally smelled the trail. Also, the Pro Mk.IV doesn't appear to be that far removed from the Competition Mk.II, just with a different seat stay treatment and headlugs. Same BB, virtually the same fork too. 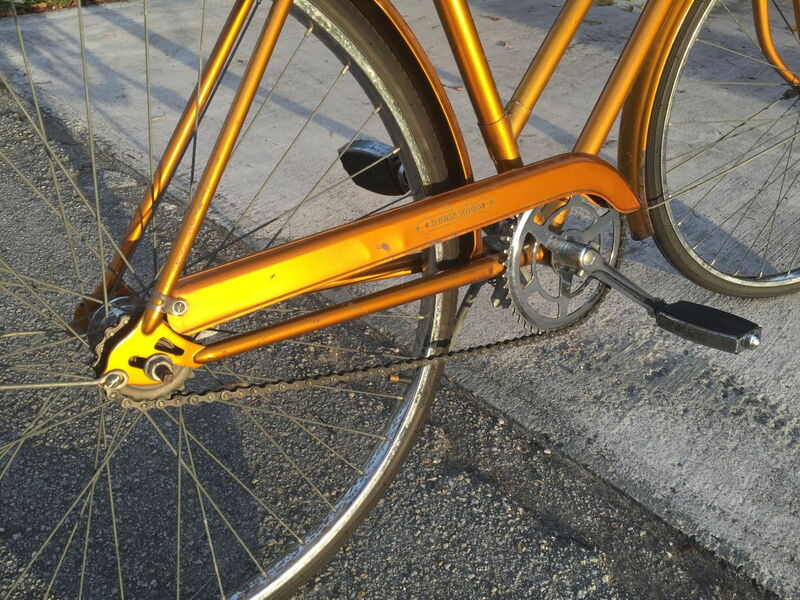 The tighter rear triangle is probably the biggest overall difference that actually affects the ride. You need not have to mention the Internationals - a friend had three of them, of which I was involved with them far more than I wish - and I have a small one kicking about in the shed at the moment. 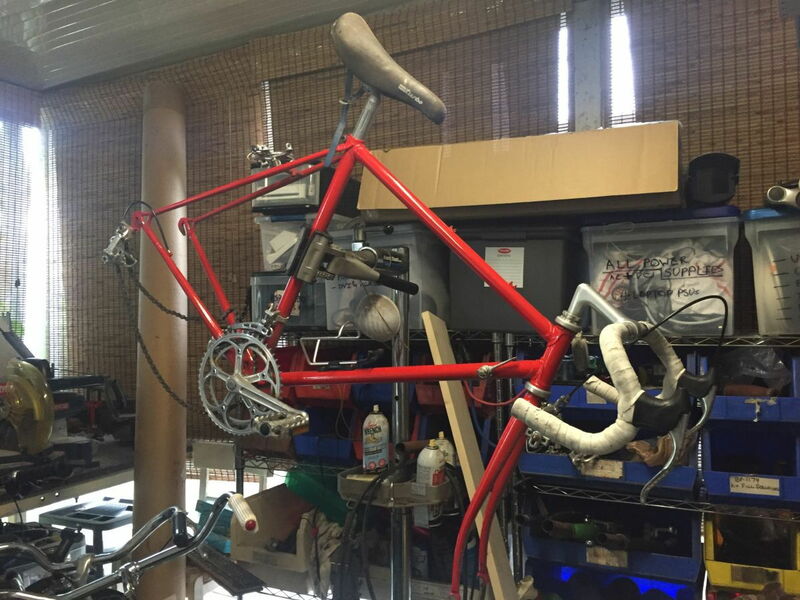 If there was ever a model of bike in the Raleigh bin that deserves the title of "parts built," the International is it. Not a single one of them were identical, fork blades seem to be chosen using the "this bin is nearest" philosophy, and the build quality ran the gamut from "really rather nice for a production bike" to "I can't believe they could braze it that bad, even when drunk." 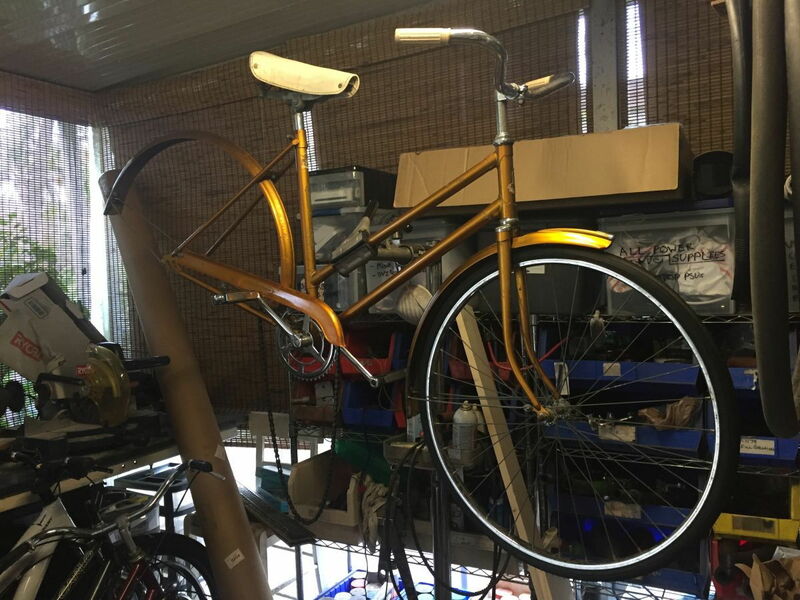 I swear the blades on the Inty that I have now may have been destined for a completely different bike - though it makes sense for a short frame. Not for stability, but for toe overlap (and that just brings the Terry frames into discussion). I think I can envision that. Somewhat. Thankfully, I'm certain the Romani will require less destructive procedures. The Super Record post may even be salvageable. The Super Record post survived completely intact. It's a remarkably good design for this sort of thing. 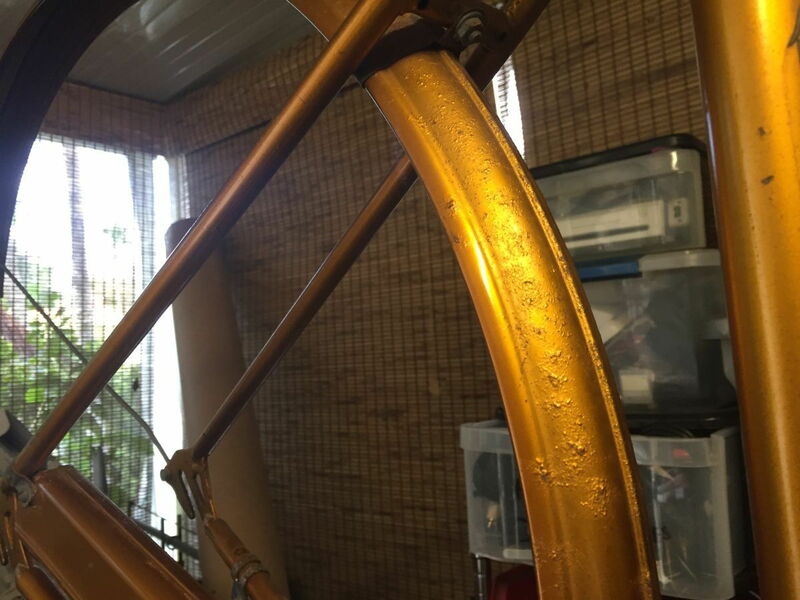 What probably isn't evident in these photos is that the repaint on this thing is either way too thick (usually around the top), or way too thin (usually around the bottom). Where it's neither, it's way too drippy (usually where it's vertical). At any rate, I figured I'd spruce it up a bit, and so cookie-cuttered some two-layer vinyl decals for it. Took way longer to install than they should and they're about as professionally executed as the paint job. Still, the darn thing at least looks like it has some swagger now, and the uneven outlines somewhat look like the rough color registry of older decal transfers. 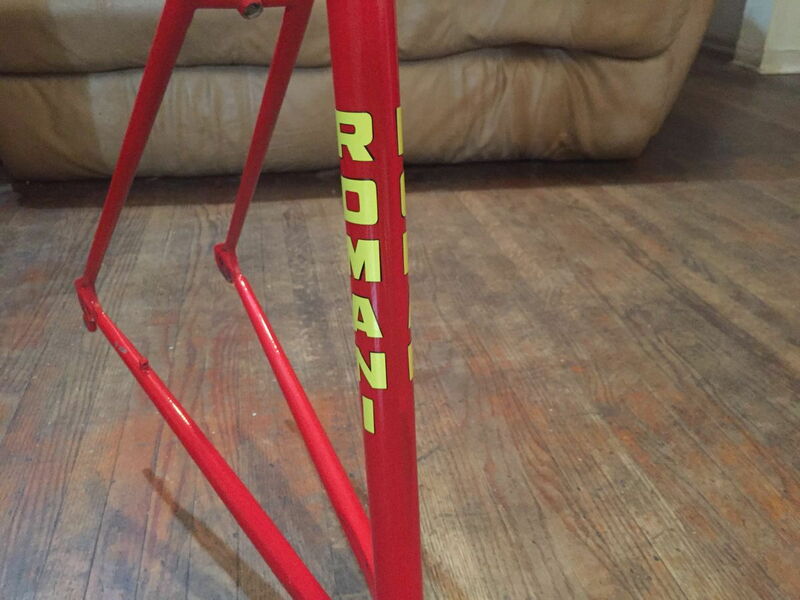 I would have used white - like the one other red Romani pista of the same era that I've seen here on the forum - but yellow is the only contrasting color I have kicking about at the moment. This excuse was good enough for me, and I cut the main letters in yellow. Doesn't look half bad. Last edited by cudak888; 04-05-19 at 10:30 PM. 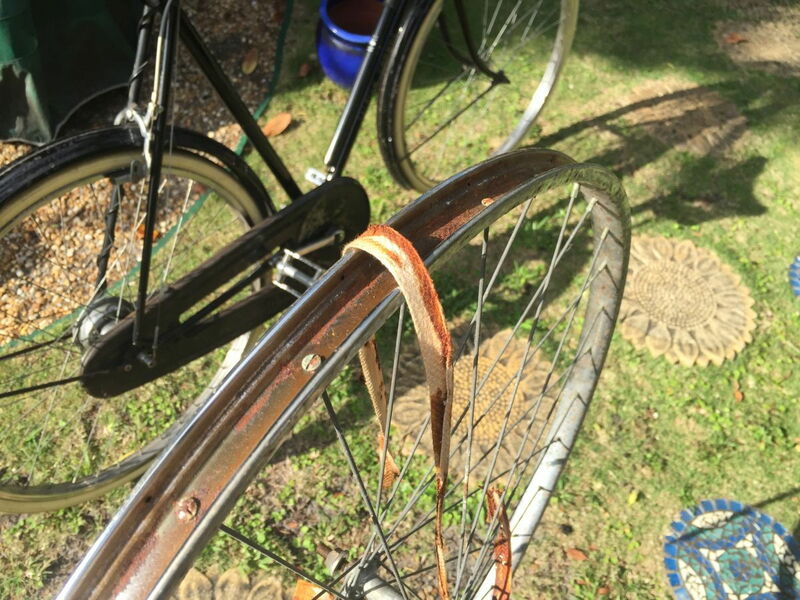 The Robin Hood has far more rust on the rear fender than I saw when it was in the bike pile. Not thrilled about it, but it'll do - I didn't really have a choice. Despite this, it presents really nicely, even with the rusty bits. That gold color is a winner. This one has something I've never had the ability to see in person until now - a Sturmey SC coasterbrake. Dated 4/69. Should have been a deal breaker, but...hey, no SGP, no Pro Mk.IV. So tempted to throw all the parts of this onto the Raleigh International, but the International is pretty much promised to a BF'er. 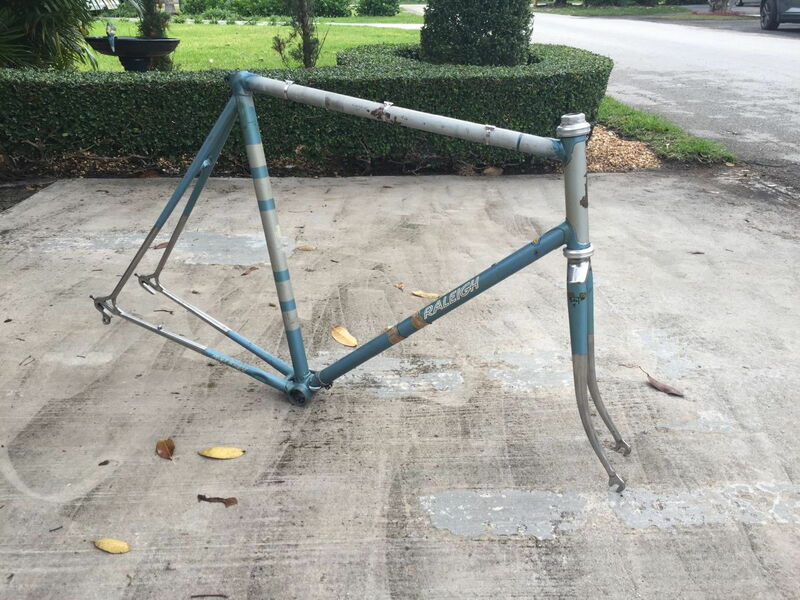 Not worth it to throw these bits on the ugly Fuji Finest frameset I have either. Stinks. I know all of you are probably waiting for the Raleigh Pro pics. Well...here they aren't Fact is, I need to get the "extras" of this lot serviced and sold so I can have room here again (I already have too many unremarkable flipper machines taking up space), so that means the Robin Hood - the most complete bike of the lot - gets a trip to the Park stand first. This thing wouldn't be that remarkable if it wasn't for the fact that this appears to be its first substantial service since 1969. 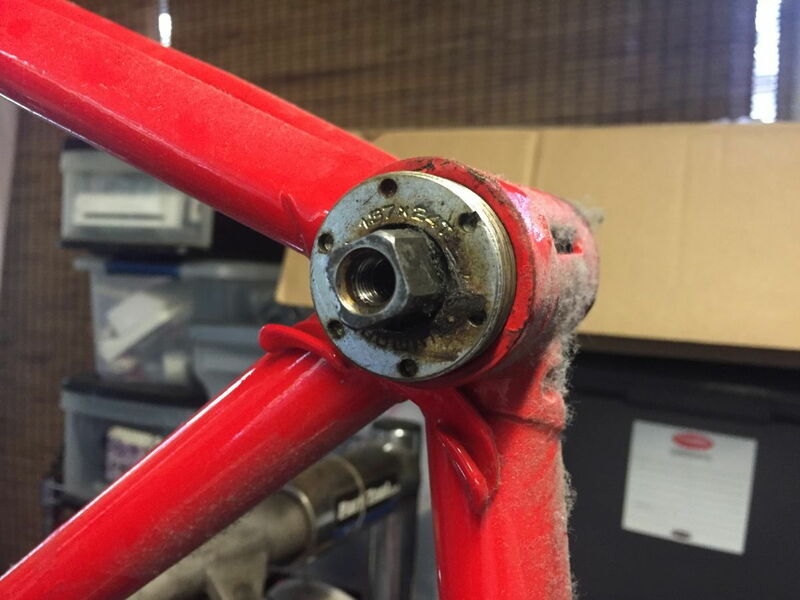 I took off the rear wheel, and found that the Sturmey SC's washers have made their imprint on the dropouts exactly once. That's it. 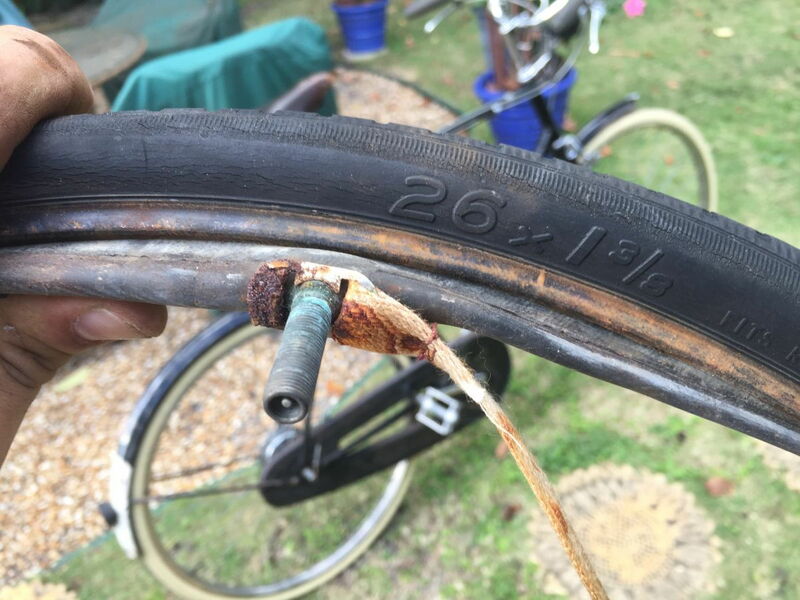 Today was the first time in 50 years that the rear wheel came off - since it was new. 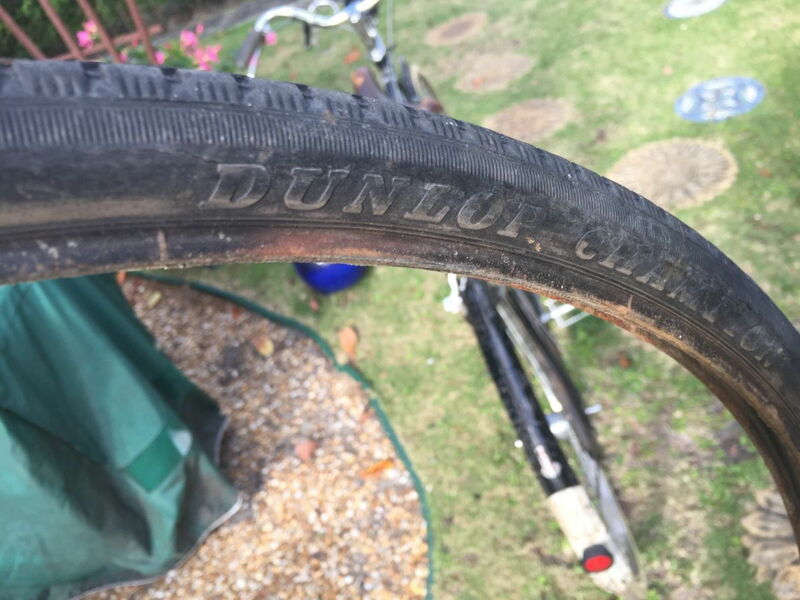 Also evident of this were the tires, and what was in them: Matching Dunlop Champions with the original tubes and cloth rim strip. What really shocked me was how the cloth is kept together - with a chromed buckle at the valve stem. Despite all the English 3-speeds I've worked on, I've never come across one original enough to have this thing still in place. 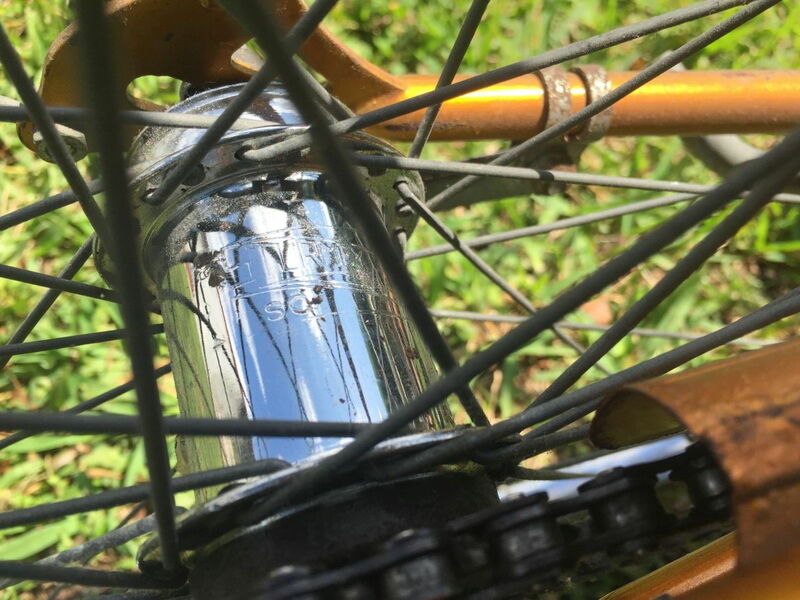 Given that it also latches into the threaded valve stem, it seems wholly unnecessary and difficult - I'm surprised the tube isn't more prone to puncture over it (I do realize, of course, that the sharpest edges are pointing towards the rim, not the tube. Still, surprising). Apparently, the Dunlop Champion on the back decided that it'd had enough of darkeness, and decided to open the blinds up for a better view of the world. This didn't end well for the tube. The rest of the bike is cleaning up nicely. Lugwork leaves a lot to be desired; it's gappy as heck. 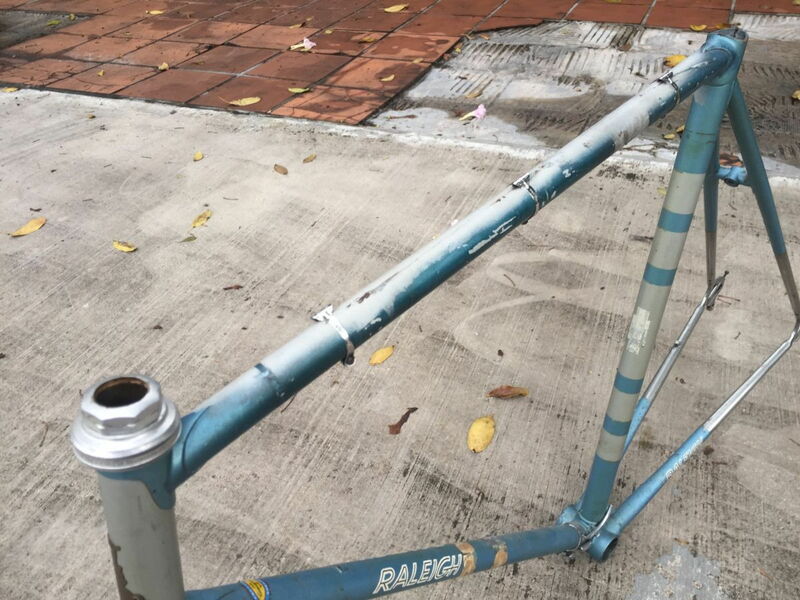 Typical Raleigh high-ten ("High Carbon Steel!") construction of the late '60s into the '80s - what else is new? Still, it presents nice. A shame about the rear fender. Got the Robin Hood buttoned back up. Didn't have time to clean the chrome (except the wheels), but this thing really pops. Tilted the saddle nose up one notch too. 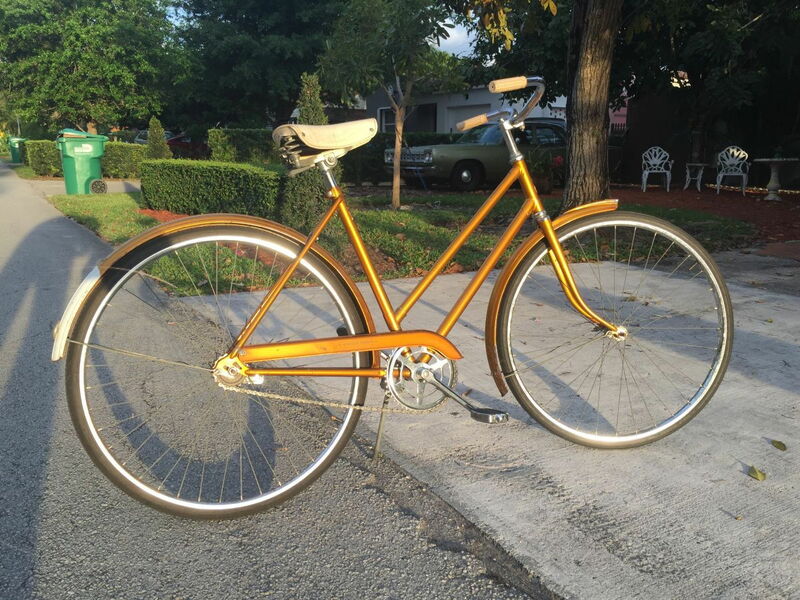 Side note - the Sturmey SC may be a pretty coaster brake, but it certainly lacks for functionality in comparison to the cheap units that every other bike has come with since the 1980's. The cones are well adjusted, it spins beautifully w/no play, but it just doesn't perform well. Wouldn't want to rely on this thing in a panic stop situation unless I was standing on a pedal - that's what it took to get it to lock up...just barely. Last edited by cudak888; 04-07-19 at 07:52 PM. 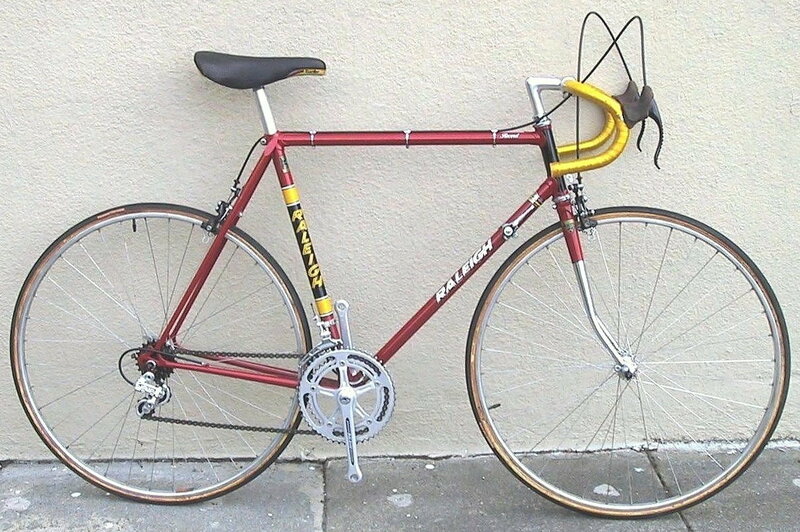 Swept-back handlebars will give a Raleigh road bike floppy handing. I think it's a mistake. I had that problem, and it was solved when I went back to drop bars or even flat-ish bars. You mean the effects of way too much trail and not enough rider weight pressing forward on the bars? The International has that problem. Way too much trail; the steering feel can be described as "flopping around" - it really ought to be called "better than DL-1 but still DL-1 handling"
I'll see about it. I don't want to upright-bar the Mk.V, even though its geometry is better suited. Last edited by cudak888; 04-10-19 at 05:40 AM. I think that's what I'm saying. I had swept back bars on my Super Course and on my International. The front end geometry is similar. And they both had that problem. 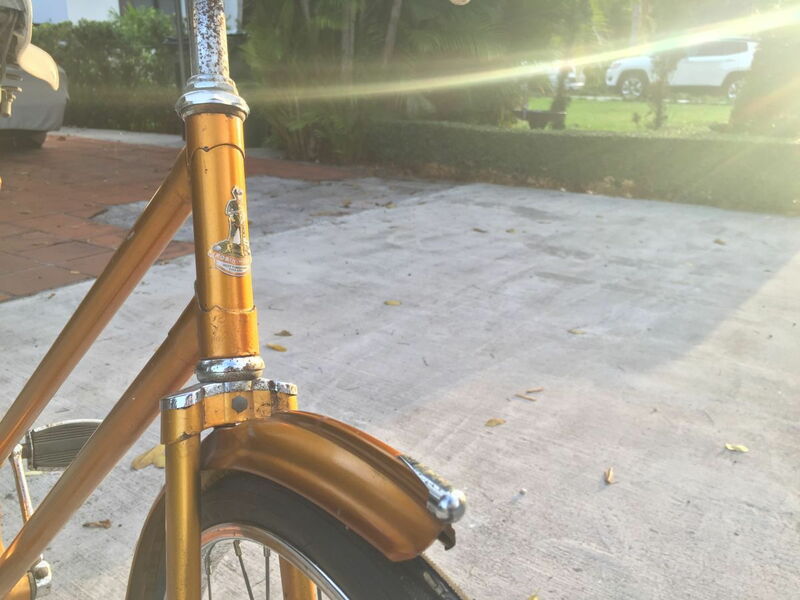 You may like your International better if you put flat bars on it. Same thing as the oft-criticized fault of the Twenty. The Pro Mk.IV may be a bit steeper; I'm not sure. The International is waaaay to small for me. It's spoken for by a BF member.